I’m not much of a knitter. I don’t know how to follow directions very well, so only go back and forth with no fancy alterations. That being said, I was very pleased with a scarf I just finished. I was in the Dollar Store, and they had this Lion Brand Fun Fur yarn for, well, obviously, $1. I grabbed a couple skeins of the 2 colors they had, and finally found my knitting needles with a little help from Rob. They were still in a bin in the shop. I used the really big ones–size 13. After a few views on U-Tube, I remembered how to cast on, so I put 15 stitches onto my needles, and started knitting. I just kept knitting back and forth (garter stitch) until I ran out of yarn, then bound off and knotted the yarn. I wove the ends in with a crochet hook and I was done. I did not need a super long scarf. If I had wanted it longer, I would have continued with the second ball of yarn, or made the width skinnier, by casting on only 10 stitches. 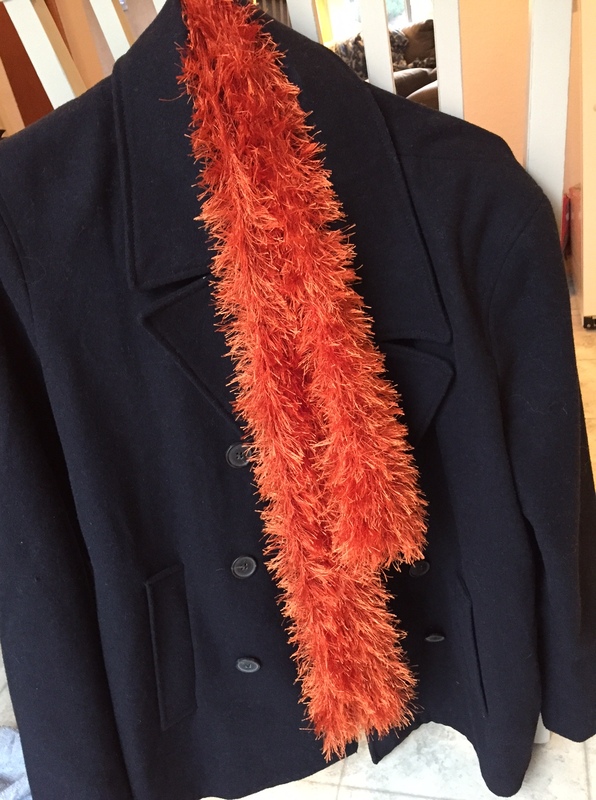 What I wanted it for was to add some color to my winter coat, not for warmth or wrapping around a bunch of times. I got this coat after Christmas last year for only $10, on clearance. Adding my $1 scarf made it much brighter, but still very inexpensive. I think a scarf like this would be a good gift. It was quick to make because the needles were so big. Even for someone who doesn’t knit much, it only took a very few hours. I don’t know how much yarn would cost if it wasn’t purchased at the Dollar Store, but I’m guessing not very much. 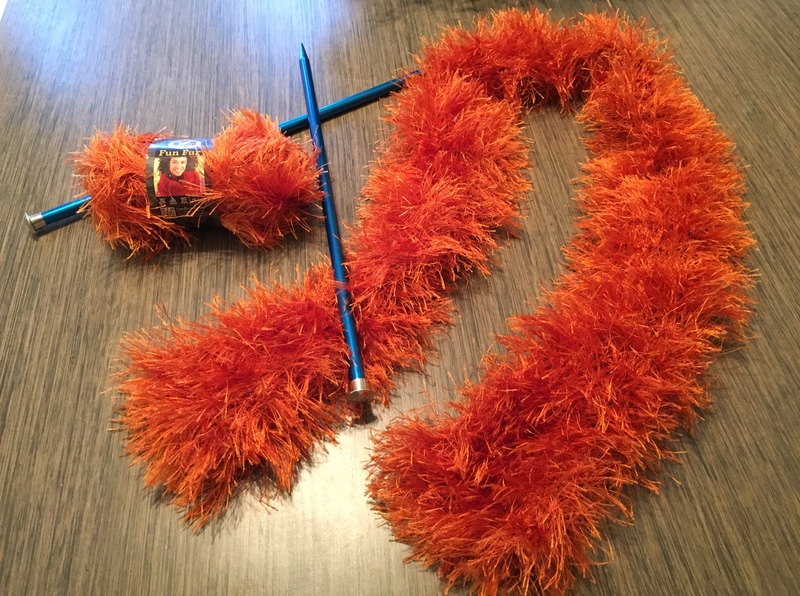 The only thing that was hard was sometimes all the extra fuzzy strands got in my way–smooth yarn would probably be easier, but it sure wouldn’t be a fluffy and soft. I’m glad I used this yarn. Thanks. Thank goodness for U-Tube. All the refreshers I needed were right there:) I don’t know how much it would cost to buy yarn at a regular store, but I’ll bet it wouldn’t be too expensive if you had a coupon for JoAnn’s or Michaels. I really love that! It it just the right touch with your coat. Thank you. It sure brightens it up! Was at the Dollar Store today for some gift wrap and hair accessories. So wish I had thought to look at their yarn! I also like them for kids coloring books but didn’t find any of those today. Don’t know if it’s true in your area, but Value Village, my thrift store,regularly sells skeins of yarn as well as knitting needles, crochet hooks, etc for about 60% of the regular retail cost. Cheers. I just walked in and there they were–in a display right in front of the door. So, I don’t know if it is usual for the store to have the yarn or not. I don’t know where a Value Village is in our new town, Salem. There is one way up north, but that’s too far, now. Rob used to take the kids there to shop for clothes–a couple of mine love that whole experience. When my youngest son Reese was about 10 years old he saw a woman in a movie knitting and asked me what was she doing with those sticks? I explained what knitting was and he said he wanted to learn how to do it. That was before U-Tube so I went to the library and checked out a video. We taught ourselves how to knit and he made soldier uniforms for his Pokemon, a bag to fit on his bike, a holder for his nintendo, all types of things. He took his knitting with him everywhere he went. I was afraid the other boys would make fun of him for doing an “old woman’s” chore, but it never happened. They all wanted to learn so I carried extra needles with us so he could show his friends. I was the person with the outdated stereotype. We still wear the knitted hats he made for us. That is so awesome! I’m glad he enjoyed it and it seems like he made quite a few things. I’ve had 4H boys do things like sew, knit, etc. before. Sometimes for boys, it’s about the machine and the parts, but several actually did really well. That is exactly the type of scarves I knit… and I only knit scarves. I think it looks just perfect with that coat and I’ll bet you use it a lot. I’m going to keep my eyes open at the Dollar Store in case any show up down here. I need a friend on the inside who will tell me when exciting shipments come in!! It was fast and easy for me. I’m betting someone who actually knows how to knit well is even faster:) I am loving the bright color and it’s supposed to turn cold over the weekend, so I’m betting I’ll wear it to church Sunday. So pretty.. Love the color and it makes your coat extra pretty.. Great deal on it.. Thank you. It turned out to be an easy way to perk up my coat, for sure. I’m enjoying it.